John B. Marine | 7/18/2018 11:05:00 AM | Be the first to comment! Thank you for your interest in "John's Blog Space." I am John B. Marine, a native of Houston, Texas, USA. I have been blogging since about 2005 (give or take). The content that I produce is completely original even if it may seem like something you would find in some form of educational material. That is because I believe in offering content that is professional. I call it being casually professional because I like offering useful content while not being overly serious. I do take myself seriously, though. John's Blog Space is my blog about anything and everything. It has been the mothership of the various topics featured here. "John's Blog Space" is a personal blog as well as the main hub to a lot of my online content. This blog was established on January 23. 2009. In the past, it was a blog I made to focus on the Gran Turismo video game series. I then decided to feature a variety of topics. I then introduced fashion and beauty to the blog. I then offered game reviews. I talked about sports. Many of the topics I focused on would later be served up in their own niche blogs. No matter what is discussed, I always do so on a mostly "casually professional" level. I will not use my blog to make annoying posts or anything damaging. The range of topics and when they are discussed are only part of the allure of this blog. 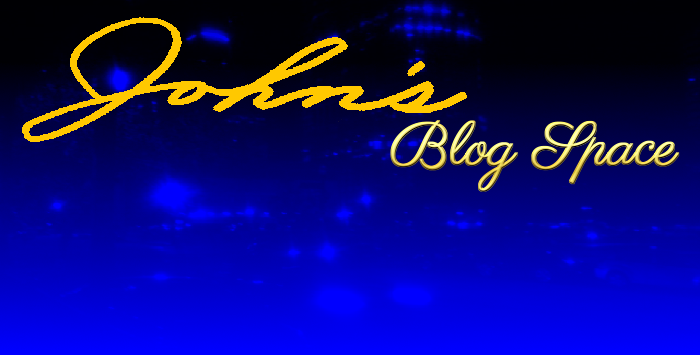 Of my blogs, "John's Blog Space" is the oldest and the largest blog of mine. NOTE: The following are all based on 2016 figures. "John's Blog Space" averages about 450-600 visitors daily. This blog monthly gets between 12,000 views to 15,000 views. The average is usually somewhere around 12,500 monthly. Distribution of my content is done through social media. Posts are fed to my Facebook profile, my Facebook fan page, Twitter, and even Google+. Most of the distribution is done through dlvr.it and NetworkedBlogs. Additionally, visitors are encouraged to follow my blog(s) through Bloglovin'. This blog is monetized through Adsense, but I am willing to offer sponsors to occupy the ad space in my "Offers For My Visitors!" section and elsewhere. Because "John's Blog Space" covers so many different topics with no specific niche, it can be tough to find out what kinds of material the average visitor may enjoy. The best way to determine what sponsor(s) would be the sponsors I would go for with this blog mostly depends on the most successful and popular topics. So therefore, I would be interested in finding sponsors in the following departments based on popular topics: fashion and beauty, video/computer gaming, and technology and software. You are more than welcome to offer me relevant advertisements and sponsorship if you like my work. The items in that section are all placeholders that can willingly be filled with your sponsorship to me and my blog(s). I want my readers and visitors to take in certain relevant offers if interested in my work and if interested in helping support my work. As much as I would like publishing material, it would be nice to know I can financially profit from my work. You may name your own rates and prices towards posting whatever you would like to pay for me posting a picture or a text ad for your web site in my blog's offers section. For example, you may suggest me posting a certain advertisement for some amount of time and pay a one-time fee as an advertiser. As far as payment options go, I am reluctant being paid via PayPal for commission work. PayPal links and buttons can be found in a lot of my posts. Proper advertisers and sponsors can contact me for my PayPal ID in case you would like to send me money for my work. Or, you may let me in on who to request money for in posts I create for certain individuals. I am fairly inexperienced in the department of sponsors and advertising. However, I am always looking to learn and adapt. Once again... thank you for your interest in advertising. SERIOUS INQUIRIES ONLY! Use the "Contact Me..." section to contact me with proper, legitimate offers to monetize my blog and offer things to visitors. I want myself, you (as advertisers/sponsors), and my readers/visitors to benefit from my material. Thank you for reading! Take care and be well.